Osborne’s AGRI-AIDE Slant Wall Fans expel condensation from buildings while keeping interior walls free of obstructions. The “slanted” design effectively exhausts corrosive gases while allowing condensation build-up to drip outside of buildings and away from animals. 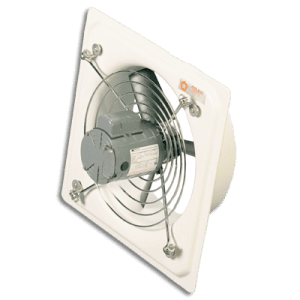 Easy-to-clean and maintain, Osborne Slant Wall fans offer a lifetime of service. Totally enclosed, thermally protected, heavy-duty, variable speed 1/6 HP motor. Polypropylene fan propellers with replaceable blades. Nickel-plated motor mount and front blade guard in radial design for less air restriction. Plastic shutters and lightweight poly blades on fiberglass rod pivots. 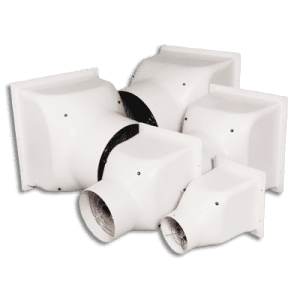 Osborne RTM-Glas™ fiberglass-reinforced plastic housing that is absolutely rigid, impact resistant, and cannot rust or corrode. Contact Osborne for pricing and shipping quote. Max Airflow 1221 CFM at 0.125 in. w.g.